CARBONDALE, Ill. -- Daniel Bach’s path toward earning a degree in cinema took several turns the past few years. He has been a construction worker, a warehouse manager, an engineering student, and he worked for non-profit organizations. Bach even found time to be a third-party online retailer with his own business. 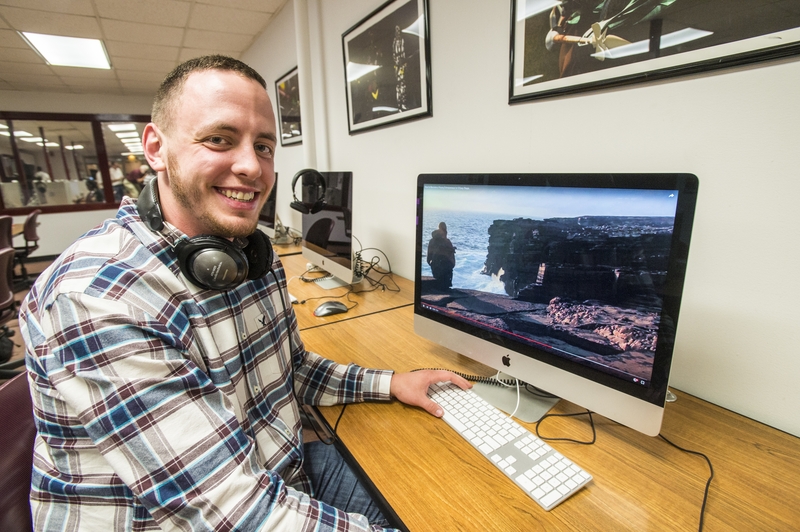 Along the way, Bach rediscovered his passion for filmmaking, and will earn his bachelor’s degree during Southern Illinois University Carbondale commencement exercises for the College of Mass Communication and Media Arts at 5:30 p.m., Saturday, May 14, at the SIU Arena. Bach was one of two SIU Carbondale students last fall named University Innovation Fellows by the National Center for Engineering Pathways to Innovation (Epicenter). The program provides students with tools and knowledge to help increase entrepreneurship, creativity, innovation and design thinking. He spent a week during spring break at Stanford University, honing communication skills and learning more innovative practices that large companies, such as Google, Microsoft and Lucas Films, utilize. Bach’s online company, Video Grouch Bag, operates through Amazon, and sells small housewares and other items. Bach said he had $150,000 in sales last year, selling “anything and everything I can get my hands on.” It helped finance his way to his degree. After attending the College of DuPage and earning an associate degree in liberal arts from Waubonsee Community College, Bach moved to Bend, Ore., after an invitation by his sister, Mary. He took engineering classes at Oregon State University-Cascades, a branch campus of OSU, but “decided that wasn’t for me.” Bach said he was “always more passionate for filmmaking,” dating back to his childhood and high school. While he loved the region and his work as a crew leader with the Heart of Oregon Corps, Bach recalled SIU Carbondale’s reputation for film. He started at SIU Carbondale in fall 2014. Bach is working on a documentary “The Rainmaker’s Garden,” that focuses on Dave Dardis, a local artist and SIU alumnus from Makanda. He is about to complete filming and anticipates it will be about 20 to 25 minutes long. Bach was one of 25 students last year to earn a Research-Enriched Academic Challenge (REACH) Award for the project. Jyotsna Kapur, a professor in cinema and photography and Bach’s adviser on the film, said she first came to know Bach in her “Introduction to Film History and Analysis” class, a large lecture-style class. Bach made an impression on her even then, she said. “I have found Dan's curiosity and passionate engagement with people and his environment; his openness to questioning assumptions; and seeking a deeper understanding of why we are where we are absolutely invigorating,” she said. Bach said he likes documentary and narrative films, and plans to pursue a career in filmmaking and acting and continue with his online business while looking for additional opportunities. He began making videos in high school as a way to express himself. Bach said it is important to take advantage of the numerous opportunities available at SIU Carbondale. Through the Big Muddy Film Festival, Bach was able to meet filmmakers and alumni Edgar Barens, a 2014 Academy Award nominee, and Kris Swanberg, whose film, “Unexpected,” premiered at the 2015 Sundance Film Festival. Daniel Overturf, a professor in cinema and photography, said Bach financed his own way last summer to participate in an interdisciplinary university program to Scotland. Bach “knows how to take initiative,” Overturf said.